Summary: This spectacular walk is the southern Yorkshire Dales classic and probably the most popular of all walks in the National Park. And that includes the Three Peaks. 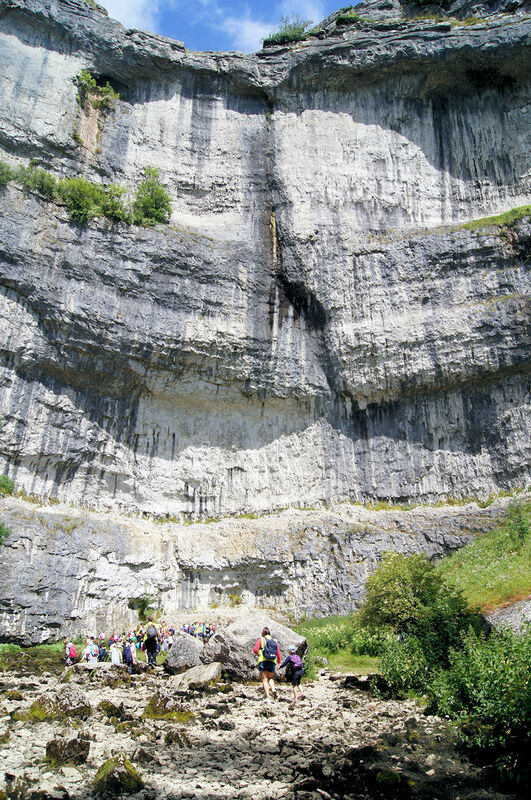 The circular course crosses some of the best limestone scenery in the Dales and in turn visits Janet's Foss waterfall, awesome Gordale Scar, quiet Malham Tarn and finally the towering limestone scar at Malham Cove. The scenery alone is enough for the average walker to over sate oneself but there is much more to this walk. Take time to imagine the past and look out for evidence of early settlements in the area. There are many clues to find on a field trip of history with medieval fields and mining sites on the route of the walk. And wildlife abounds too particularly in spring and summer. 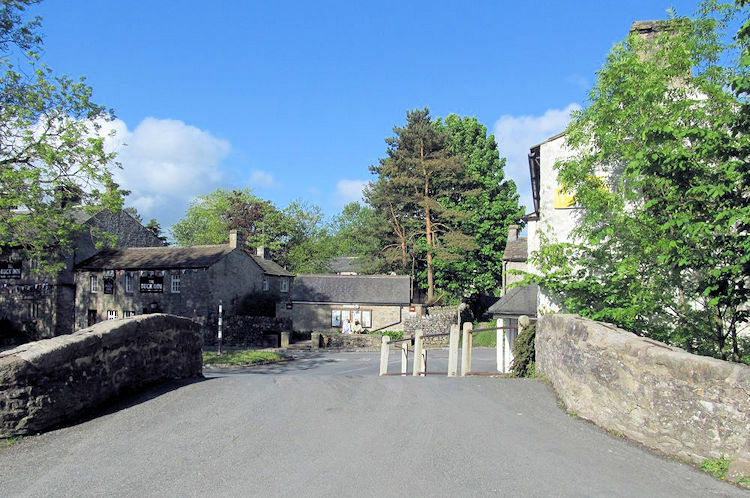 The walk is an abundance of opportunity for bird watchers for there are many water birds to be found at the tarn, moorland birds to be spotted on the higher ground and then there is the chance of spotting Peregrine Falcons at Malham Cove. I felt it was about time I did this most popular of walks again. I had walked all over the area and even created my own Yorkshire Dales Long Distance Walk in recent years yet I had managed to avoid the obvious 'number one' dales walk. Time to put that right. I left my home with summer sunshine in evidence. By the time I reached Malham one hour on I was looking up at dark skies and rainfall. The weathermen had promised me a good day though and soon after arrival the rain ceased and the clouds began to lift. I changed into my walking gear and by the time I was off walking south from the village to Gordale Beck the skies began to clear. I knew it would be a good day to walk. 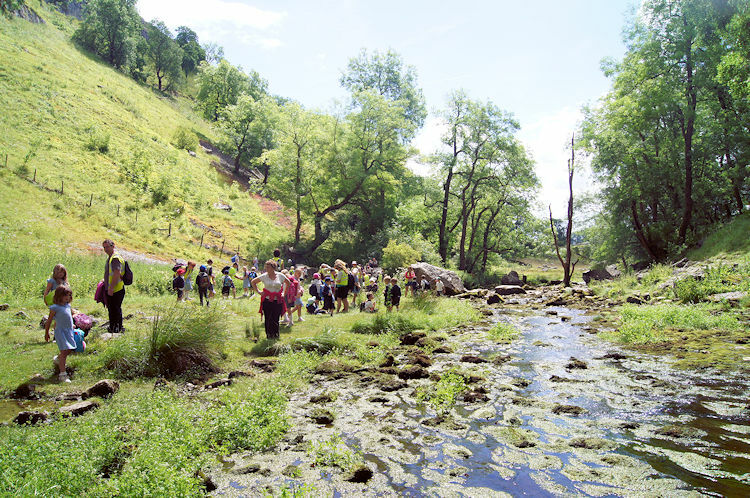 I was glad I was going in the direction I was for about 300 schoolchildren were being organised into walking groups when I left Malham. No doubt they were bound for the Cove. I guessed I would see some of them again when I reached the Cove later in the day. 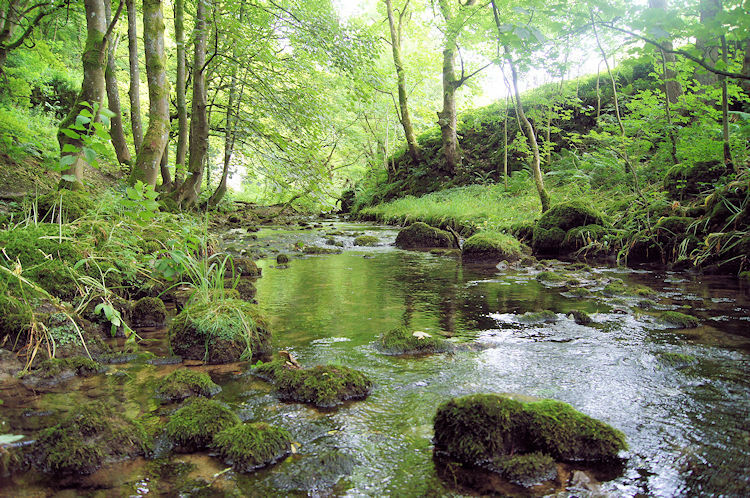 With that thought in mind I set off from the village by walking south and then east to my first destination at Janet's Foss which included a short section of delightful walking beside Gordale Beck as it trickled through Wedber Wood. I continued through Wedber Wood until it brought me to Janet's Foss. 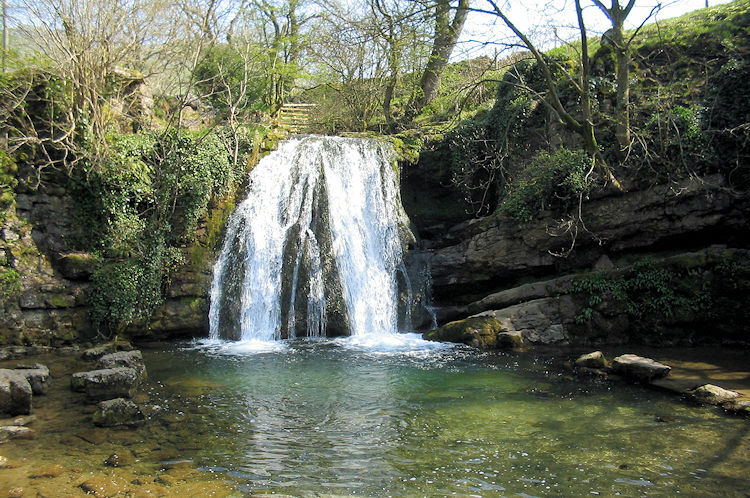 The waterfall at Janet's Foss is quaint and in an enchanting setting, akin to a setting for fairies. It is usual for families with small children to picnic here and while the adults watch dutifully the children will play in the shallow drop pool created by the foss. After enjoying watching the delightful foss which I surprising hasd for myself I headed off to, what was in the imagination of Victorian painter James Ward a much darker and fearful place. 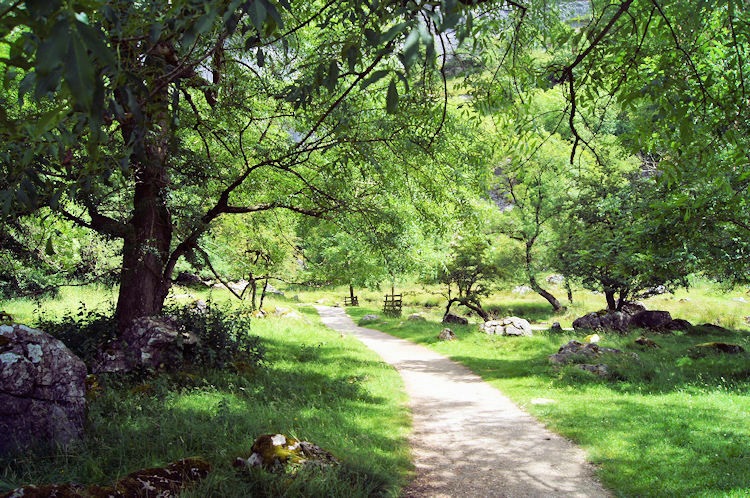 I was now bound for Gordale Scar which he envisioned as menacing. The contrast in just a hundred yards or so is amazing. Janet's Foss is surrounded by lush green grass and trees and the scattering of woodland flowers make the locality so full of colour. After I had left and made my way north to Gordale Bridge the colours became less profuse. From Gordale Bridge the continuation north into Gordale Scar took more green away from the colour spectrum the further I ventured in. Gordale Scar greets the visitor from Gordale Bridge with a welcoming wide entry flanked by the two cliffs of New Close Knotts to the left and Cross Field Knotts to the right. The further up into the scar one goes the closer the flanks become until suddenly the easy path is ahead is barred by the lower of two waterfalls. In the confine of the narrowed gorge there is no grass, the only green being mossy under the flowing waters of Gordale Beck. This is a place so frighteningly inspirational that James Ward's thoughts were not confined to him alone. The poet Thomas Grey 'shuddered with awe' at the imposing cliffs sparsely populated by gravity defying yew trees. 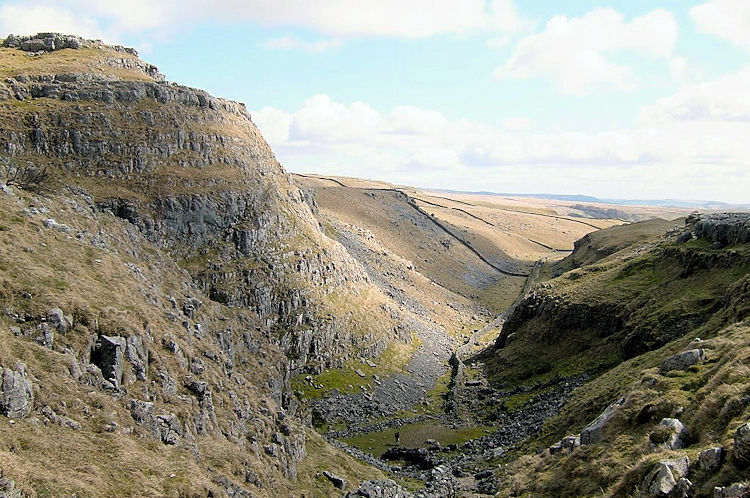 It has also inspired Wordsworth to write a poem which included the line "To Gordale chasm, terrific as the lair Where the young lions couch". Indeed if Janet's Foss is fairies then Gordale Scar is goblins. Most people immediately recall the lower waterfall when thinking of Gordale Scar but personally I find the upper waterfall more spectacular as it powerfully gushes out of the side of the east cliff face. Make your own choice. 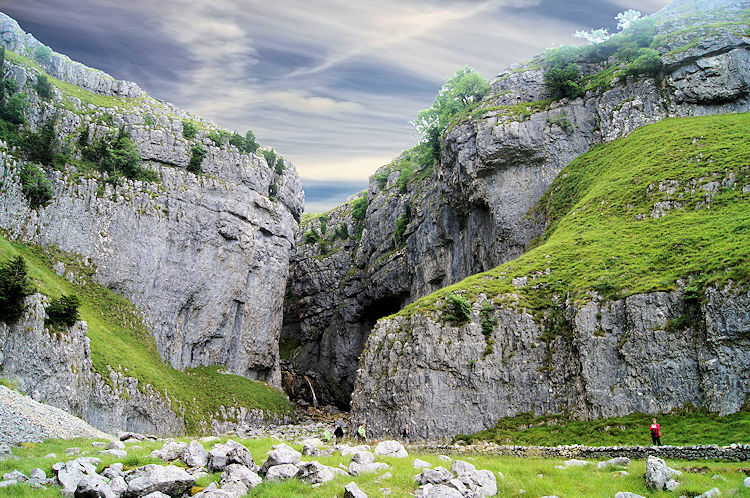 After your fill of Gordale Scar take a deep breath. It is a tough beast to leave for to follow the course of this walk the lower falls must be scrambled over. A drenching can be expected in the wet (after storms the waterfall climb is dangerous so an alternative course must be retraced back to Gordale Bridge and around the scar to the left over New Close Knotts). 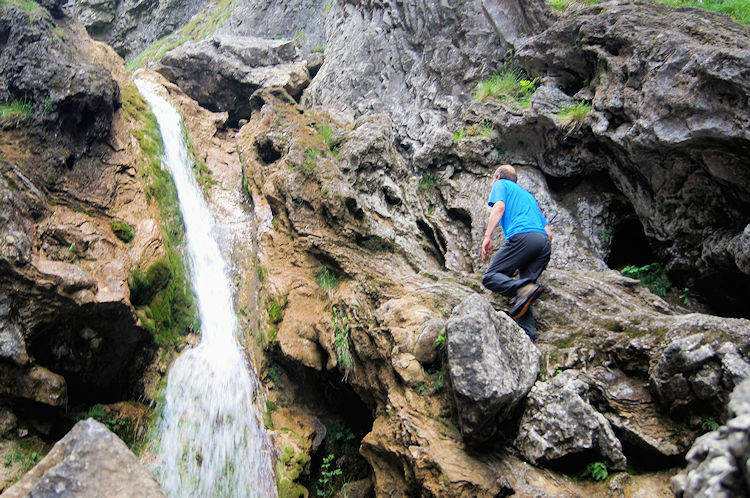 After scrambling up the waterfall a steep climb follows to ascend onto the limestone flats due north. If you make the climb you are allowed to say "Phew". The beauty of this excellent walk is that one highlight follows another. It is a bit like a 'best of' collection where all your favourites are lumped into a convenient compilation. Two highlights were already played out on my walk and I was quickly approaching the third. 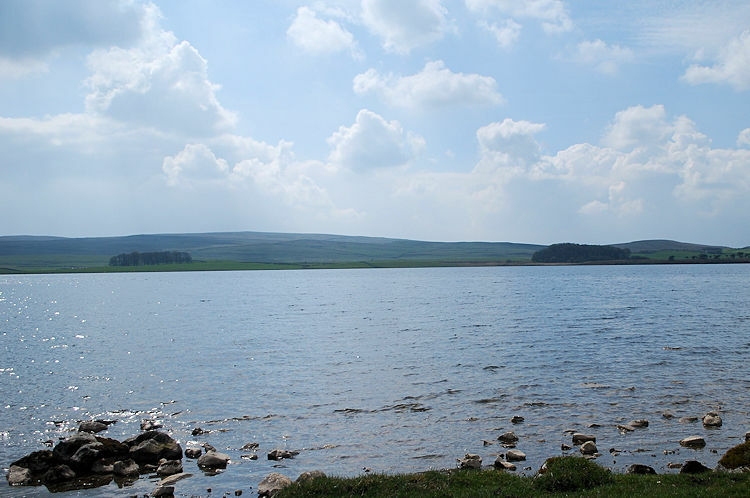 Malham Tarn is a peaceful relief after the hustle of Gordale Scar. The tarn is a haven for many native upland waterfowl including Moorhen, Great Crested Grebe, Coot and Teal. It is also a superb spot for a break particularly if its sunny. As it was I did. 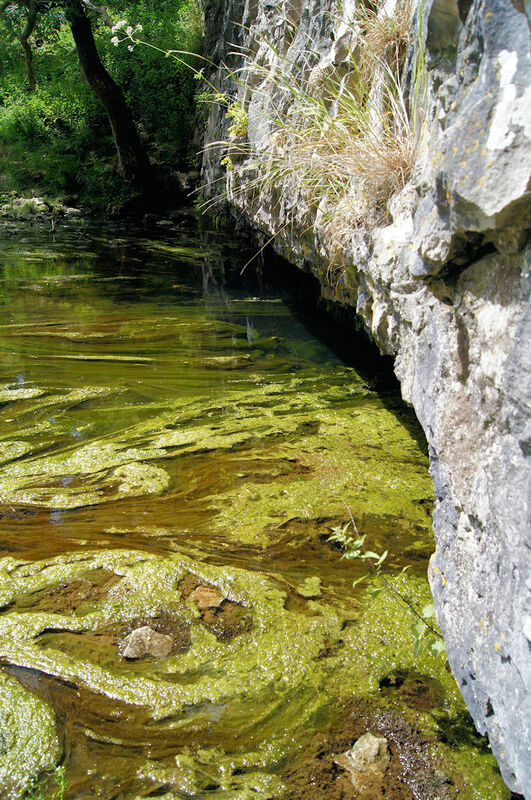 After leaving Malham Tarn I followed the beck flowing from it until it disappeared underground at Water Sinks. 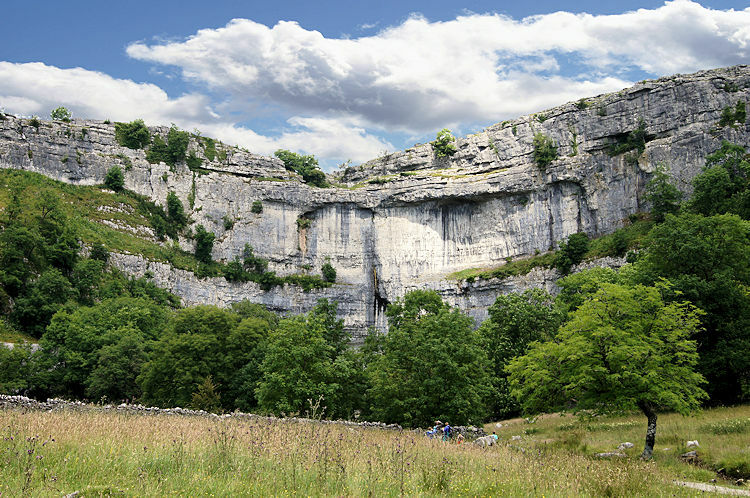 I was not to see it again until Malham Cove. (just 1 km west of this point is the site of a 19th century smelt mill where calamine - zinc ore - was processed for use in the making of brass) After Water Sinks I followed the course of the Pennine Way to Ing Scar Crag and the beginning of the dry valley of Watlowes. As I walked along the Watlowes gorge I imagined the spectacle it must have been after storms in ancient times when waters spilled along the gorge and cascaded over Malham Cove. It must have been an awesome sight. Luckily for me I was not getting wet and I enjoyed the splendid walk along Watlowes which I considered to be the 4th highlight of my walk. Watlowes was cut by floodwater just after the ice age when it was still cold enough for underground water to remain frozen for all year bar the mid-summer months. It created a spectacular mini gorge with a brilliant backdrop. The short gorge walk of about 800 metres from Ing Scar Crag to the limestone pavements on the very top of Malham Cove always inspires me to keep looking right to the small but impressive cliff face of Ing Scar and left to the rolling banks of Trougate. What I would give to see a freeze frame fast forward of Watlowes being carved out. This place is a geologists dream and all four of the walk highlights so far would satisfy most of them on a single outing. For me on this eventful day I had a fifth and final super spectacular finale to come. And even more personal the impending spectacle fashions the source of the River Aire which runs all the way to the city of Leeds. 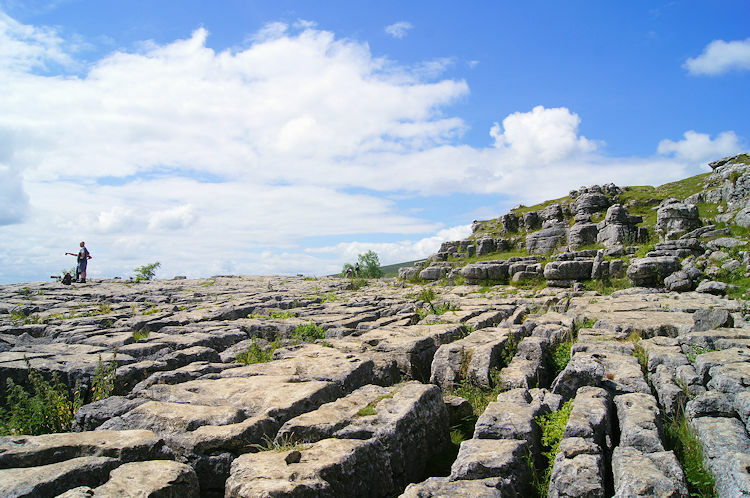 At the end of Watlowes I walked onto the limestone pavements on the top of Malham Cove. As I walked my first steps I noticed more of the limestone steps were loose than the last time - many seemed to rock as I stepped across the cove. I took a course to my left and down to the central overhang. As I looked over the edge I suffered a sickly churn of vertigo and stepped back quickly. 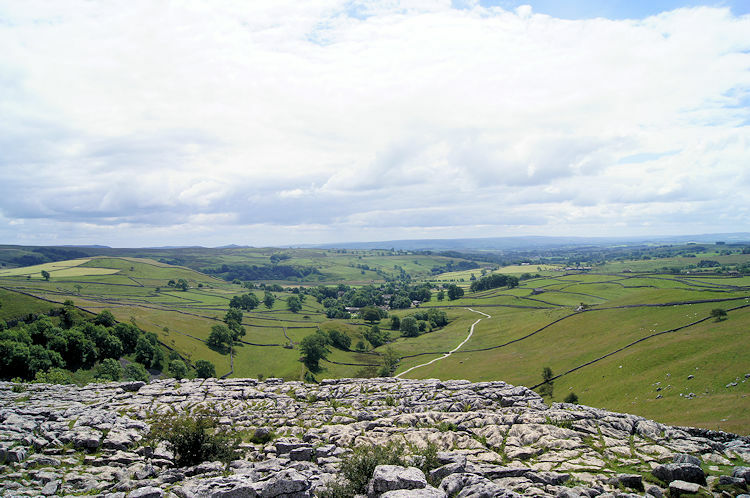 Although I was not close to the edge I felt a fearsome feeling of space and sat on a limestone seat to look out at the fantastic views over Malham and Upper Airedale. Martins and Crows soared at eye level using the thermals of the cove with the grace which birds do. Concentrating on the show all vertigo disappeared and I spent a wonderful half hour looking out over the land from above the cove. It was brilliant. As a sat I wondered what a group of about 10 people with telescopic sights were doing below. I was soon to find out. 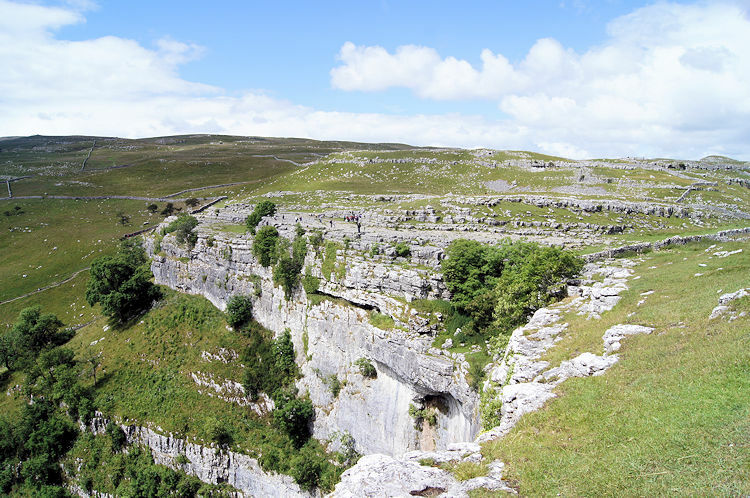 I left my perch on the top of Malham Cove and crossed the limestone pavement to descent the cove to the west. After countless steps I emerged at water level below the cove. 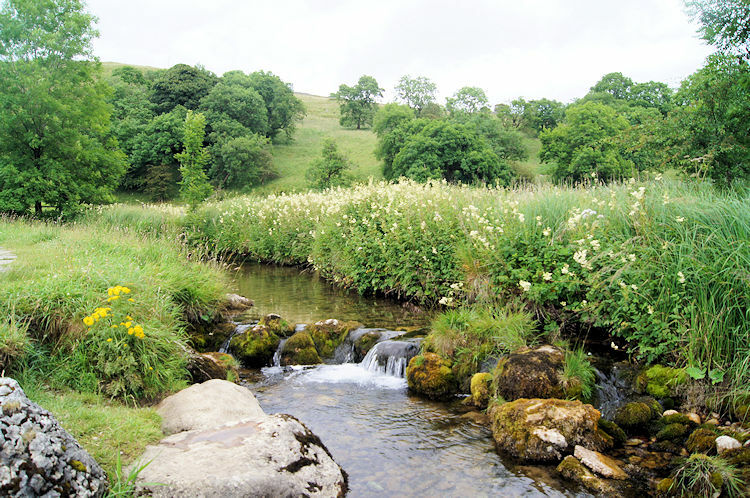 When I had completed my descent to the bottom of Malham Cove I walked along the side of Malham Beck, the new beck which begins its course at the very bottom of the cove on its short journey to the origin of the River Aire at Airton. I walked to the beck's beginning where water trickled out from the bottom of the cove. I got slightly wet from dripping water coming out of the limestone cliff face further up. Not all the source of the beck comes from the bottom then. Lots of people were at this place including many of the school groups had seen earlier. A duck rested in the water just below the cove no doubt wondering what all the fuss was about. 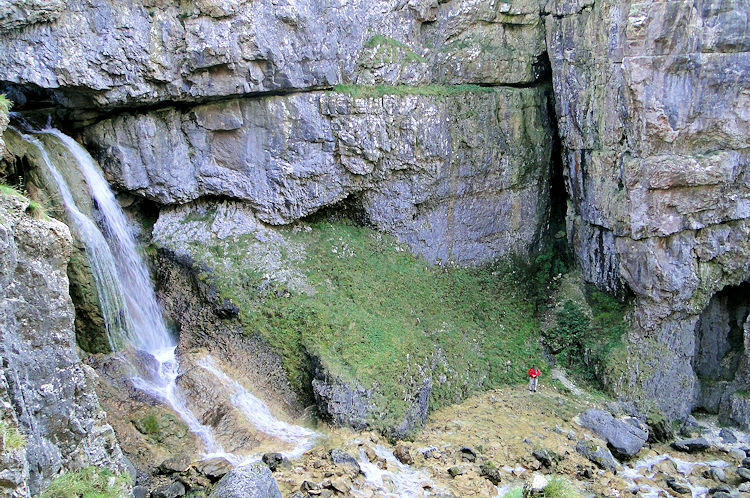 After my mini shower from water trickling out of the limestone cliff face which crashed onto small outcrops and dissolved to a spray I left and headed back to the finish in Malham. 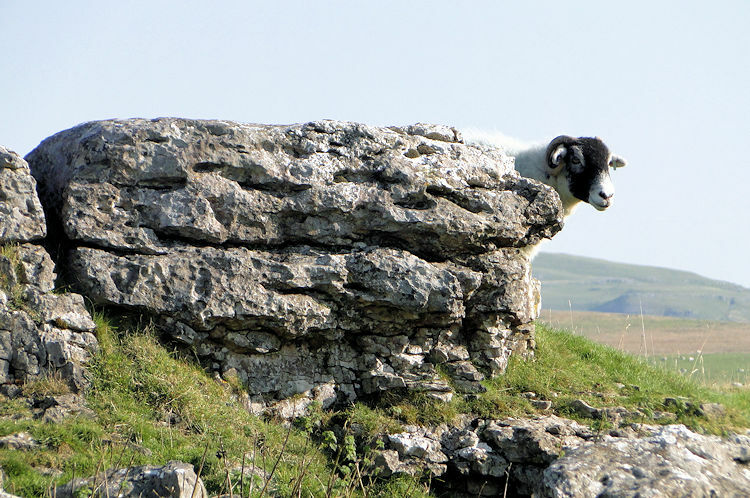 I kept glancing back at the cove as I walked away and only interrupted myself when I reached the small group of people with telescopic sights who I had seen from the top of Malham Cove. They turned out to be members of the Royal Society for the Protection of Birds (RSPB) and were watching a pair of Peregrine Falcons. One of the RSPB people told me the elder bird of the two had made a kill of a pigeon just before lunch and since then both had eaten, flirted and rested. I felt the birds had made a good choice of where to set up home. I would. For me, as probably with the Peregrines my work was done for the day. And WOW, such a brilliant day.